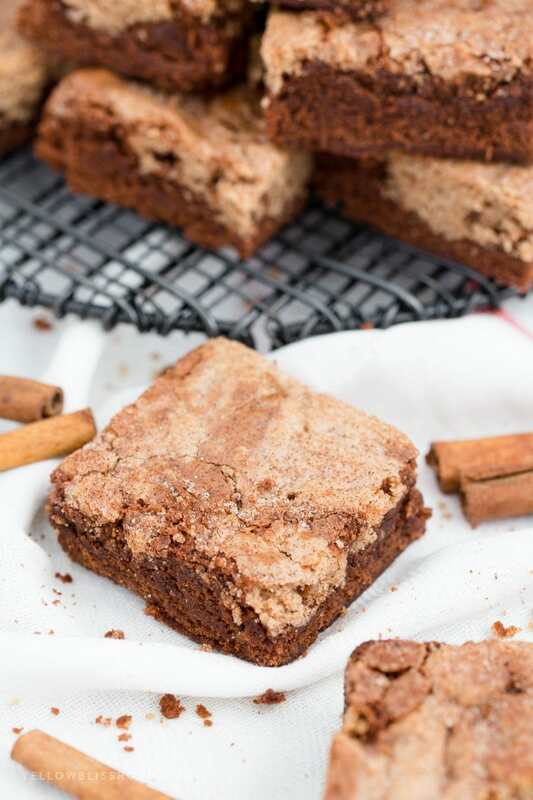 Snickerdoodle Brownies are the best of both worlds – fudgy, chocolatey brownies mixed with warm, cinnamon Snickerdoodles! It’s the ultimate classic mash-up dessert! I am not typically a “sweets” person. I will take a bowl of salty popcorn over ice cream pretty much any day of the week. If I had to pick a favorite sweet snack though, it would be brownies, with Snickerdoodles running a close second. 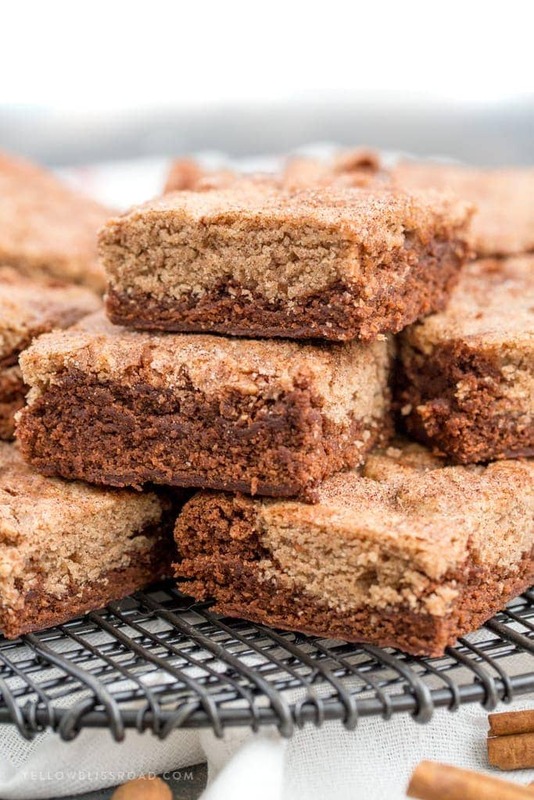 SNICKERDOODLE BROWNIES ARE THE ULTIMATE MASH-UP! I had this brilliant idea a while back to mash the two together to make Snickerdoodle Brownies. I pondered on it for a while, and kept putting it off because I wasn’t sure the flavors and textures would pair well together or that it would be too time consuming to test out. Well all that went to the wayside when I finally put my grand Snickerdoodle Brownies idea to the test. They are THE BEST BROWNIES I’ve ever eaten. 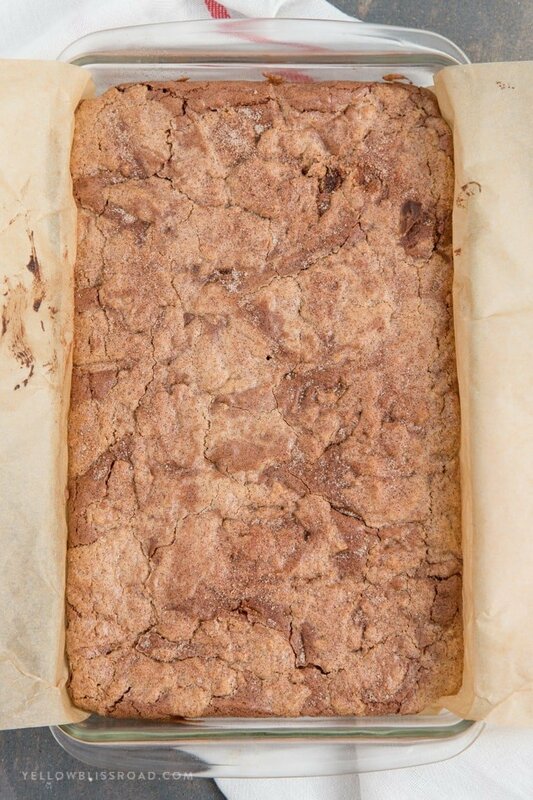 I used my favorite One Bowl Brownie recipe for the base, and changed up my favorite Snickerdoodle Cookie Bars recipe to make the batter a little less thick. Brownie batter is combined in one bowl, while the snickerdoodle batter is combined in another. Then the fun begins. Pour the brownie batter into an 11×7-inch baking dish that’s been lined with parchment paper, then drop teaspoons of the Snickerdoodle batter all over. The Snickerdoodle batter will be too thick to spread over the brownie batter, so give the batters a gentle swirl with a sharp knife. The final touch was a generous coating of cinnamon sugar all over the top. It adds a lovely, sweet crunch when baked. Line the pan with parchment paper. This not only keep the brownies from sticking to the sides of the pan, it gives you handle for lifting them out. Cutting them into squares is a breeze with this method. Use a sharp knife for swirling the batter. A butter knife just doesn’t cut it (no pun intended) here. The thinner blade of a sharp knife swiftly cuts through the batter to lightly blend it. For a thicker brownie, use an 11×7 baking dish, but if you want them a little thinner, you can use a 9×13. Just check for doneness about 10 minutes sooner than the recipe calls for. 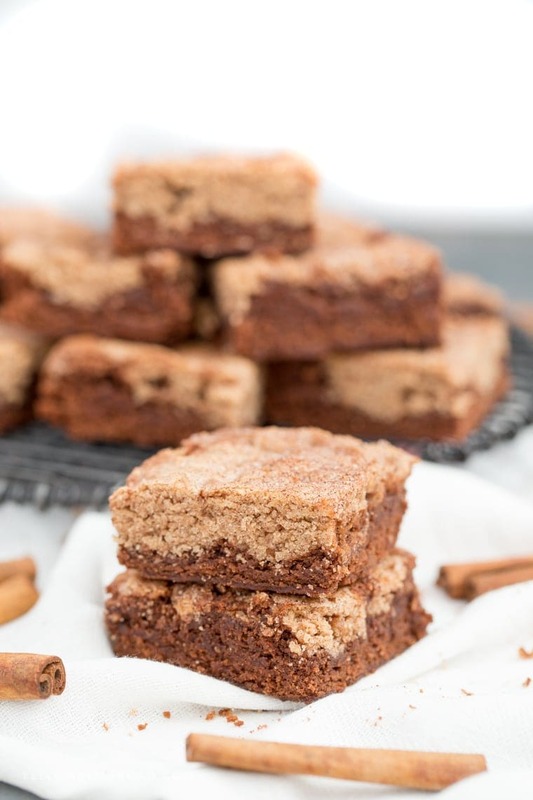 The layers of Snickerdoodle Cookie and chocolately brownies are beautiful, and they have the flavors of a Mexican Hot Chocolate. 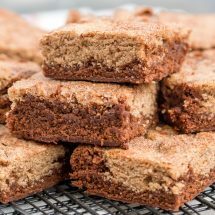 Chocolate and cinnamon isn’t a pair that you might think to use often, but for these Snickerdoodle Brownies, it was positively amazing. Parchment paper – I prefer parchment to foil; it’s just easier to work with and is just as nonstick. Plus it just looks prettier! 11×7-inch Baking Dish: Lots of recipes from casseroles to cakes call for a 11″x7″ baking dish, so this glass baking dish is a good staple to have in your kitchen. Small, sharp knife – Larger than a paring knife but smaller than a chef knife, this 4 1/2 inch utility knife is perfect for swirling the batter, or chopping smaller fruits and veggies. 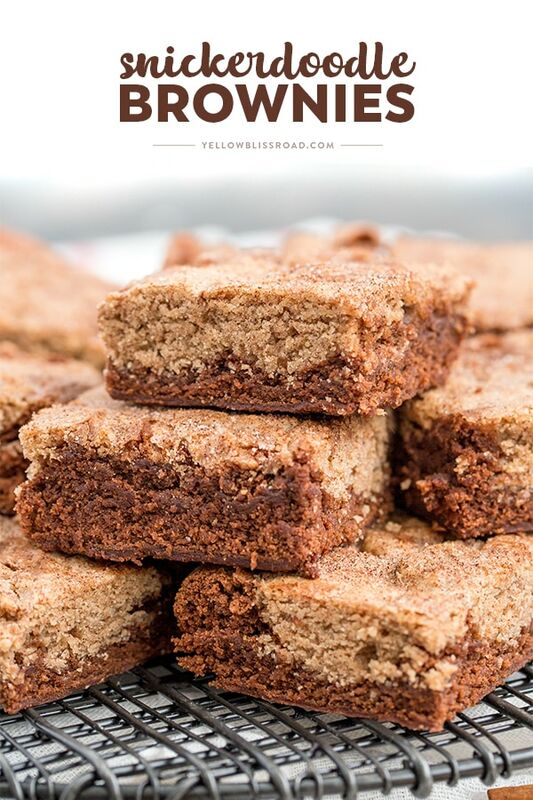 Snickerdoodle Brownies are the best of both worlds - fudgy, chocolatey brownies mixed with warm, cinnamon Snickerdoodles! It's the ultimate classic mash-up dessert! Preheat oven to 350 degrees F. Line an 11x17-inch baking dish with parchment paper or spray with nonstick cooking spray. In a medium mixing bowl or stand mixer with the paddle attachment, beat softened butter, ½ cup granulated sugar together until fluffy; about 1-2 minutes. Beat in egg yoke and vanilla for another minute. Gently stir in flour, pinch of salt, baking powder and 1 teaspoon ground cinnamon, just until combined. Set aside. Place butter and chocolate chips in a microwavable, medium-sized mixing bowl. Microwave on high for 30 seconds. Stir, and continue microwaving and stirring in 30 second intervals until chocolate is melted. (This took about 1 minute for me). Beat in sugar, then vanilla and eggs, until well combined. Stir in flour and a pinch of salt, just until combined. Pour the brownie batter into the prepared baking pan. Drop teaspoon-sized scoops of cookie dough evenly over the brownie batter. Using a thin knife, gently swirl the batter into the dough a few times. In a small bowl, stir together 2 tablespoons granulated sugar and 2 teaspoons ground cinnamon. Sprinkle evenly over the batter. Bake in the preheated 350 degree oven for about 40 minutes. Check for doneness with a toothpick. Allow to cool before cutting into squares and serving. What size baking dish was in your picture? You mentioned an 11 x 7 baking dish and a 11 x 17 dish in the above recipe. Which one should we use? For the cookie layer is it unsalted butter? Hi Kristen I am about to make these Snickerdoodle Brownies and I had a question on the cookie layer, the ingredients say to use 1 egg but in the directions it says to use an egg yolk. Do I just discard the egg white? I can’t wait to make these. Yes I used just the egg yoke in that cookie layer. It wouldn’t hurt to use the whole egg though.